Dr Raymond Casey, at the age of 94, remains an indefatigable collector. Yesterday, I saw him in animated conversation at London's Philatex stamp show. A couple of weeks before, he was at my table at London's Strand Stamp Fair - and,remarkably, I found something ( a small something) to offer him for his Ship Mail collection. Today, I sat down at my computer and watched the sale of his Grand Prix collection of Russian Post Offices in China, Mongolia and Sinkiang. I didn't get the item I really wanted: a 1918 insured letter from Pekin to Petrograd, returned as undeliverable even before it reached the border. It interested me as showing that in the Pekin Russian post office, they still thought Petrograd a possible destination as late as May 1918. The conventional wisdom, endorsed by Dr Casey (page 17 of the catalogue), is that the Romanov stamps were not stocked in the China post offices (let's leave out Mongolia and Sinkiang from this and stick with China). However, so the story goes, they were valid for use if supplied by the customer - and this is how we come to find examples of them. 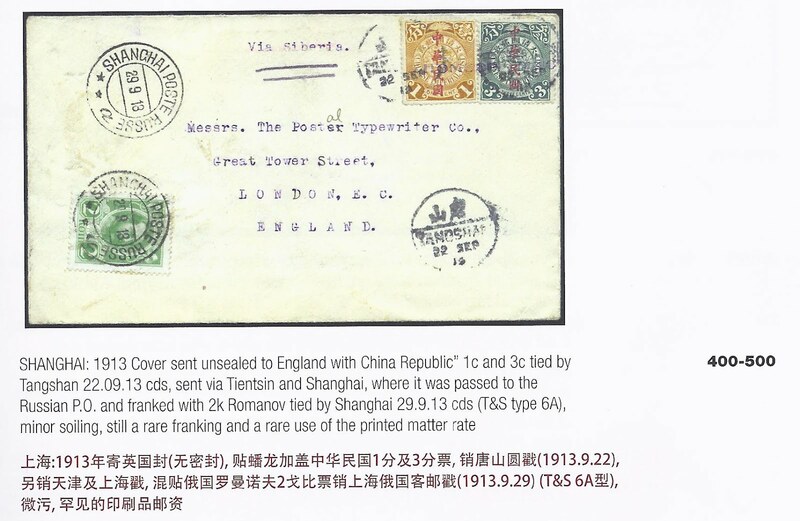 In the Feldman sale, no PEKIN items are franked with loose Romanov stamps; one very philatelic KALGAN cover has a 3 kop Romanov (Lot 20047); no CHEEFOO or HANKOW items have Romanov frankings; but two SHANGHAI items, both seemingly non-philatelic and dated 1913 and 1914, have low value Romanov frankings ( 2 kop, Lot 20064 - shown above - and 10 kop x 4, Lot 20065). 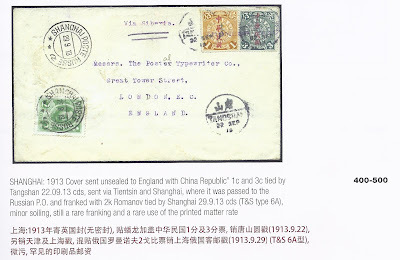 In the recent past, I had in my stock a fragment of a wrapper from Shanghai the franking on which included a 4 kop Romanov. I am sure I have seen loose stamps with Shanghai cancellations. So my hypothesis is this: for some reason, the Shanghai Russian Post Office did receive some Romanov stamps for its stock. Maybe they asked for some. Dr Casey's collection realised over one million euros, with only one Lot unsold. You can consult the results at www.davidfeldman.com where you can also browse the illustrations of every Lot.